Not everyone in Europe is greeting the thousands of refugees from the Middle East and Africa with open arms. Some locals in countries like Serbia and Hungary have expressed their discontent with the chaos and piles of trash the asylum seekers leave behind. Plastic bottles, cardboard boxes, empty plastic packets, and untouched humanitarian aid can be seen in photos and videos shared on social media depicting the transit refugee camps and heavily littered migrant route. Images from the Roszke refugee camp at the Hungarian-Serbian border – a part of the Western Balkan migration route – show a trash lined roadside littered with empty tents left behind when the asylum seekers left the area. The rubbish trail on the border between Hungary and Serbia appears to help some navigate in unknown territory. Asylum seekers say they have nowhere to put the garbage, complaining of the primitive conditions they have to endure in transit camps. Some even flee the camps in attempts to reach Budapest and then Austria and Germany. “I am telling the police I don’t want to stay here. 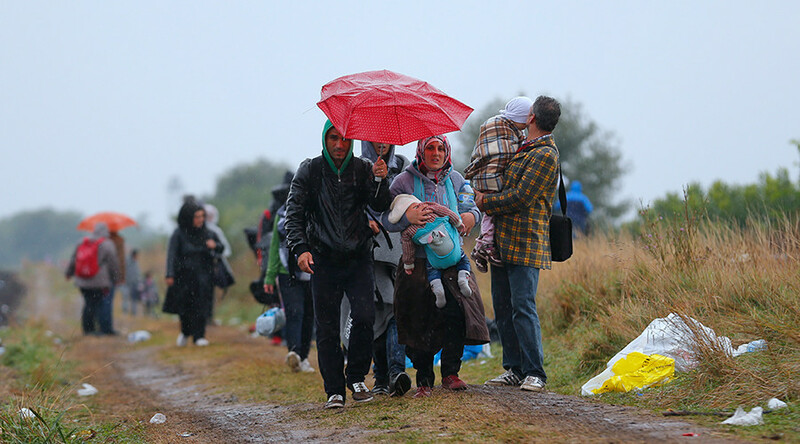 Either let us go to the camp by walking, or let us go free to go to West in buses or taxis,” Syrian refugee Mohammed told UN refugee agency staff stationed at Roszke before breaking away and running towards the abandoned railway tracks which lead to Budapest. The humanitarian situation doesn’t appear to be any better in Serbia. Parks and public spaces in central Belgrade have been turned into makeshift refugee camps full of dumped supplies and rubbish, RT’s Daniel Bushell reported. “Apart from everything else, the smell of trash everywhere is absolutely overpowering. No idea how people are living and sleeping around this. Insects, rats, cockroaches are ever-present here with the rotting food,” he said. One of the ‘refugee campers’ showed RT his tent, which houses two people. He explained that he keeps all his belongings there – from food to dirty clothing. Local residents told RT that the camp and surrounding areas are very dirty. “To be honest I’m scared of catching something from all the dirt there. There is a lot of disease in those camps and I’m afraid for our children around here,” said Luka, a local resident. “Here around the camp it’s dirty, a lot of rubbish. I understand those people have their own problems, but I don’t feel safe walking around here in the evening,” said another local, Ana. Some Hungarians don’t seem to be very happy with the refugees who leave a trash trail behind, either. Local activists from the city of Gyor in northwest Hungary have created a Facebook page, where they have posted photos and videos from the trains which transported the migrants to Germany, as well as from local public areas where they stayed. Így néztek ki a vonatok amelyekkel a migránsokat szállították Németországba.Pictures from the trains which trasnported the migrants to Germany. Budapest resident Maksim Gurbatov has posted photos on his Facebook page showing what he said was a national park after asylum seekers had “stopped to rest” there. “Masses of young men in their twenties with beards singing Allahu Akbar across Europe. It’s an invasion that threatens our prosperity, our security, our culture and identity,” he said. The head of the Party for Freedom added that the fact that they are heading to northern EU states indicates that they are economic migrants, not refugees. “Turkey, Greece, Macedonia, Serbia are safe countries. If you flee them then you are doing it for benefits and a house,” he said. Meanwhile, on Wednesday EU Commission President Jean-Claude Juncker unveiled a new plan to tackle the escalating refugee crisis, proposing a quota system for the relocation of 160,000 refugees. He said that the bloc is “not in a good place” and that migration must not be seen as a problem, calling on member states to allow asylum seekers to work as soon as they arrive in their new countries. Some Europeans have offered support to the asylum seekers, offering temporary housing in their homes, as well as making donations to humanitarian organizations.